For some time I have been keeper of the Great Vivitar Bestiary, a listing of every variant of 28mm lens Vivitar made to fit Pentax cameras. This includes TX mount, M42, K and KA. (It's of use to fans of Nikon etc. as well, since lenses exist to fit other brands.) Now I can announce that this site has been updated with new variants, images of each lens and a full database of information, albeit with lots of gaps for you to help fill in. 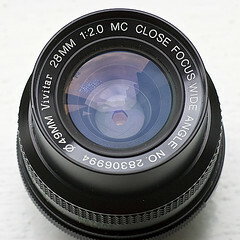 Back in the manual focus era, Vivitar were known as a great third-party lens company. Though based in the USA, they sourced their glass from the best Japanese manufacturers: Komine, Kiron and Tokina. Even now their lenses can provide excellent optics for those who do not mind -- or actually prefer -- to focus manually. When I became interested in the 28mm focal length, which provides a comfortable "normal equivalent" on the APS-C sensor, I started cataloguing the different varieties available. Little did I know then I'd end up with 38 of them! The latest update to this work is the largest yet. I have greatly expanded the introductory comments and added a section of advice and recommendations. Each lens now links to a second page which has a standard lens database template along with pictures of the items I have sourced from wherever I could. If you have better pictures or more information, please send it along! This is a community effort that started with Pentax Forums and has now spread much further afield. i was after this guy but went for the 28 2.8 K...all these lenses are incredibly sharp though its scary.